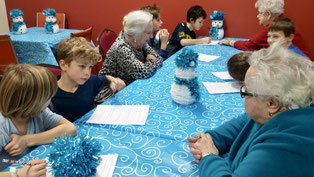 As part of an intergenerational project organized by the Townshippers Association, the Manoir Stanstead opened its doors to Phelps students on Tuesday, welcoming the grade 5 and 6 students from our Elementary Homework Program. We walked down the road from Sunnyside Elementary on our adventure, the students chatting about what types of questions they wanted to ask the residents of the Manoir and throwing the occasional snow ball. “What advice do you have for young people?”, “Where did you grow up?” and “What are your favourite activities at the Manoir?” were particularly intriguing to the students. Once there, we were greeted by the staff and residents, and quiet curiosity descended upon the group. Teams of students sat with different residents and were intent on asking their questions and listening to the insightful answers. After asking all their questions, one group was able to help a resident finish a beautiful puzzle he was working on, while other groups had a chance to share some juice and cookies provided by the kind staff. The residents also took the opportunity to ask questions of their own; “What do you want to do when your older?” was a question that made the students stop and think about their futures. Intergenerational activities like our field trip to the Manoir Stanstead are an opportunity for different groups within the community to learn from one another and build a relationship, and I believe we did just that. A big thank you to the Manoir Stanstead for hosting our group of students.